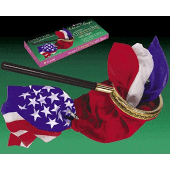 The Magic Cafe Forums - Does anyone make decent quality change bags anymore?! Usually an adult close up kinda guy but looking to do some children’s magic now my own daughter is old enough. I bought lovely change bag from an Indian magic store a long time ago but stupidly sold it as I wasn’t doing kids’ stuff. Now I want one again, but essentially there’s one change bag for sale, with a plastic handle! Who wants a plastic handle?! I know some folk don’t like change bags but for children they’re perfect - I don’t care if it looks like a prop, I just want it to look like a lovely, mystical, quality prop rather than a cheap bit of plastic. The sort of thing you could credibly claim was owned by your great grandfather and you found it in a dusty attic or something. I’m UK based but will send abroad for it if I have to! Thanks. Contact Practical Magic and buy the German one. Ickle Pickle still makes them here in the USA. The bag has a flat wooden handle rather than the round metal handle. I've had their "zippered pickleover bag" for something like 20 years now and it's held up very nicely. I'm UK based but will send abroad for it if I have to! Thanks. I wouldn't consider entertaining kids without one. Change bags are VICTORIAN ERA PROPS. I WOULDN'T CONSIDER DOING A SHOW >>>WITH<<< ONE. I worked for moppets thru college age young people, for fifty years. I respect their dignity. Here is Change Bags made in India it that is what you are looking for again. What are your thoughts about a "hidden spring" or a "tear apart" change bag? Do you find this a more "workable" type of prop? About the time that Frank Ducrot invented the 20th C Silks, dealers saw an "upsell" to amateurs who couldn't use a pull. They modified the church "utensil", and, the change bag was born. Gen Grant sold a "tote bag" later. It looked like what it was. A simple container with a draw string closure. It had no gold tassels, etc. Remember the guy who thinks, "If I had that bag, I could do that, too!" The Tear Apart bag fits the tote bag concept IMO, as long as it doesn't have gold fringe and a tassel!!!!!!!!!! Steinmeyer has an excellent change bag routine in his Conjuring Anthology. It uses the change bag as a church collection bag. Only Jim would think of using the change bag like that!!!!!!!!!!! The best "Change Bag" I have ever used was a VERY clever tip given to me by the late, great Karrell Fox at one of The Abbott's Get-Togethers many, many years ago. Like most methods Karrell used it was dumb simple....Karrell told me that "you never have to worry about having a change bag if you simply use two paper bags nested together and rolled down a bit". He showed this to me, and a HUGE smile broke out! Karrell was a genius as far as "simpler is better" as a Magician. Not only does this always work anywhere and anyplace that paper bags are available...........its very deceptive and totally innocent looking. I miss Karrell Fox, He was ALWAYS available to talk Magic at the Abbott's Get-Togethers....and I learned A LOT from him! Loftus Novelty made a metal change bag fashioned after the old P & L company. It is very high class Look like they sold out of the their original run, but have resupplied, which is unusual for them to do. Their magic is under the "Empire" brand name. Just to a search for Empire Change Bag, and you will see their change bag. Here is the Zipper Change Bag by Loftus/Empire. Makes a gag when the child puts his hand in the bag, and it comes out the bottom, proving it is empty, and funny situtation.